The first order of business for the day was to purchase our temple visit passes. When UNESCO named Angkor as their World Heritage Sites (full list), the number of tourists to Siem Reap swelled from tens of thousands to millions yearly! If the number of people walking through the ancient monuments increased at such rate, you do need to ensure they are well maintained. 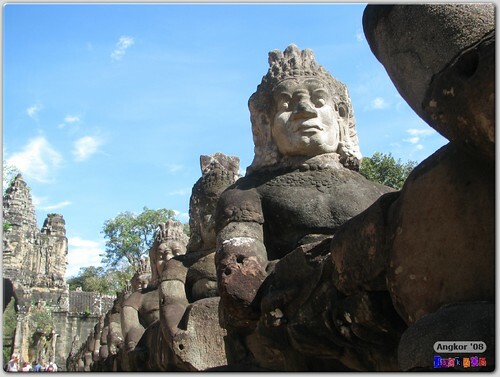 The Apsara Authority is the organization that was formed to maintain the Angkor Archaeological Parks (the collective name for all the Heritage Site-listed temples and places in Siem Reap) and its surrounding areas. To be financially viable, Apsara Authority therefore sells entrance passes to the temples. 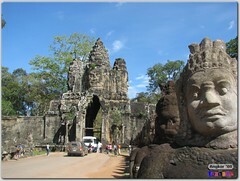 These passes – called Angkor Pass – range from single-day (USD20), three-day (USD40), and one week pass (USD60). The passes are valid from 5.30am to 5.30pm. They are flexible in terms of the hours since in our trip there were a few occasions when we were still at the temples past 5.30pm and we weren’t exactly shooed away. Interesting to note (refer top left corner) that the Apsara Authority is an ISO0-14001 certified organization. You should buy your pass at the official ticket booth (which is on the way to Angkor Wat). AFAIK no guesthouses or hotels are authorized to sell these passes on Apsara Authority’s behalf. Since these passes are not sold in advance, we were to buy ours on the morning of our 1st day. We also moved the “Sunrise at Angkor Wat” visit forward to Day 2; the idea was if we couldn’t catch the sunrise on Day 2, we still have a few days to re-visit Angkor Wat for the sunrise if we so desire. Tuk Tuk: Our main mode of transport? 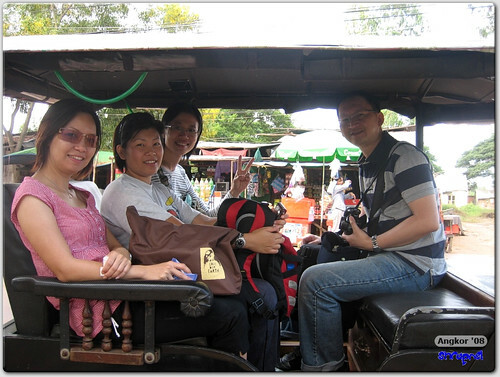 A tuk-tuk is meant to take max four adults. Usually it’s just a couple. In our case, I’d thought we’ll need to hire two cars or tuk-tuks. A single van (which can seat 5) would make more sense. After meeting Man at Pub Street last night, he convinced us it’s a better experience taking a tuk-tuk for the temple visits (except for the longer journeys to Kbal Spean, etc) and he can fit all five of us into his tuk-tuk. A van would have cost us anything from USD35 – USD45 per day (depending on where we are visiting). That’s around USD7/day for each person just for transportation. A tuk-tuk on the other hand costs on the average USD13 per day and this works out to just USD3/day. 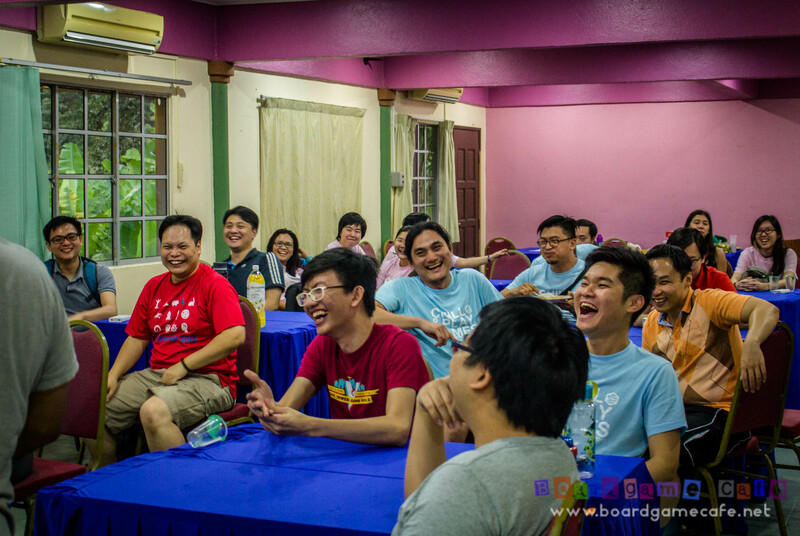 Not to mention Man seemed to have built a special rapport with his Malay-speaking mannerism. Note: Man can be reached at this email or if you wish to have his contact number, msg me. 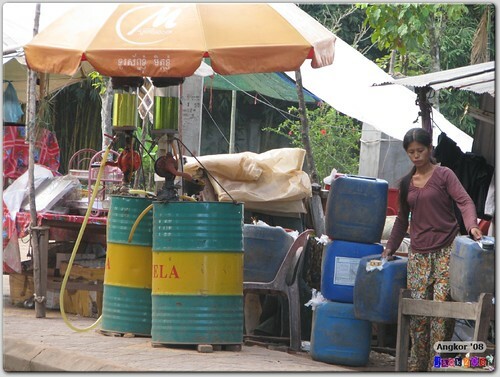 On our way to the Angkor Pass ticketing place, we saw two very interesting local scenes of Cambodia. 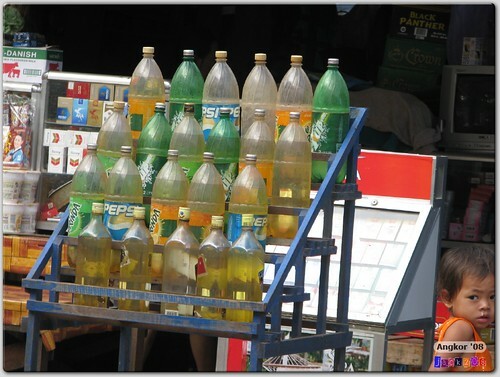 The first is this make-shift petrol kioks (pictured below)! Instead of Shell or Mobil, here we have petroleum being sold from the two tongs above. Mind you – they come complete with pumps! The second is these bottles (see above) that contained petroleum. Apparently the Cambodians especially those on motorcycles refuel their petrol by grabbing one of these bottles and refilling their vehicles on their own. Can be dangerous with the “exposed” petroleum. After sorting our Angkor Pass (entrance pass for the temples), our first visit is to the southern gate that enters Angkor Thom. 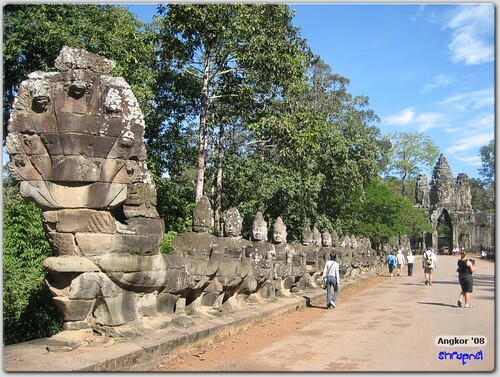 Angkor Thom is a city within the city of Siem Reap; built in the late 12th century by the most well-known king of the Khmer civilization, Jayavarman VII. It’s the largest city of Khmer at 9 sq km, with 3 km walls lining each side, and has four entrances (gates) in each of the cardinal directions. The South Gate is the most preserved (and restored) of the four gates and therefore the one most visited by tourists now. 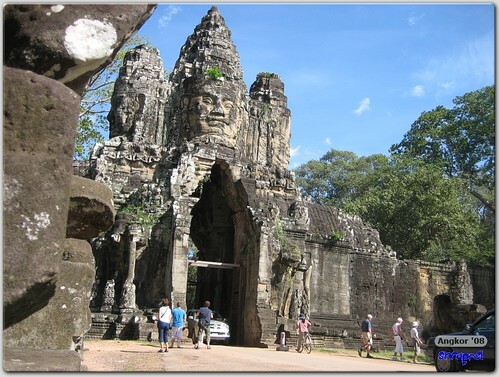 Each of the gates converged to the Bayon (state temple of the King) which lies at the center of Angkor Thom. The city of Angkor Thom as built by Jayavarman VII overlapped some earlier monuments/temples built by Jayavarman’s predecessor(s) the most notable being the Baphuon and Phimeanakas. 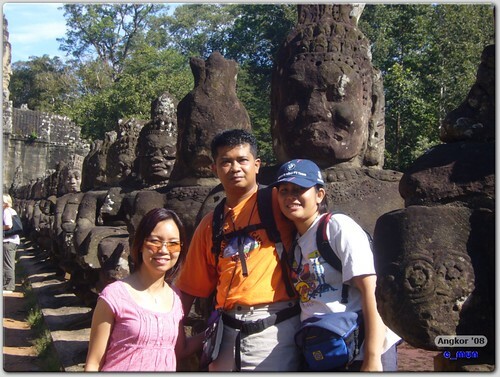 It’s (Angkor Thom) name in the Khmer language means “Great City”. 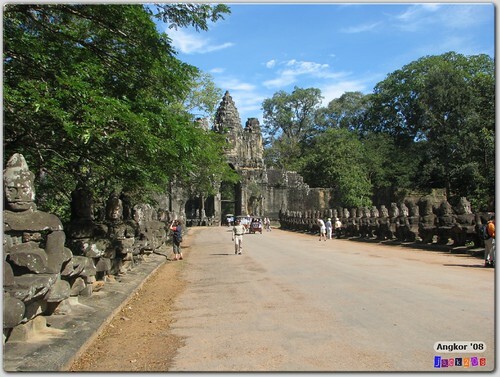 Usually the first point of entry to the city of Angkor Thom by most visitors; the South Gate is also the most “complete” of the four gates of entry to this great city. Most of the head of the statutes here are still intact. As you approach the majestic Gopura (archway entrance) of the South Gate, you will see the city is surrounded by a 100 m wide moat and a wall that’s 8m tall, lined with two rows of statutes on each side on the causeway. The tall wall & moat were mostly for defensive purpose. 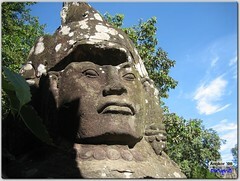 The two rows of statutes lining the approach to the entrance at the South Gate of Angkor Thom. Lining the bridge over the moat are two row of statutes that’s carrying the long body of a naga – seven-headed serpent – in a tug-of-war-like formation (see below). The Naga is thought to be the guardian of the royal wealth. A row of Gods (statutes) carrying the body of a seven-headed Naga (on left facing camera). At first glance, the statutes on both sides of the bridge look similar. They are not. 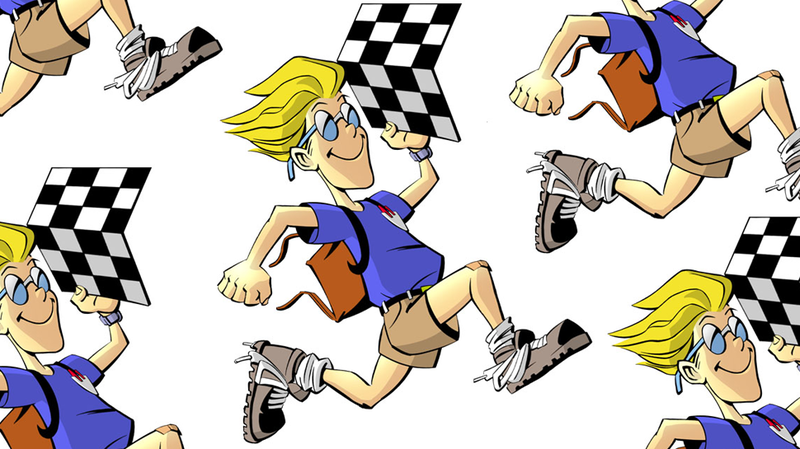 On the left (picture above) are the Gods. They look more serene, and has rounder almond-shaped eyes with conical headdress. On the right is a row of Asuras (demons) which look fierce with their combative military head-dress (see picture below). They too carry the body of a naga like the Gods. 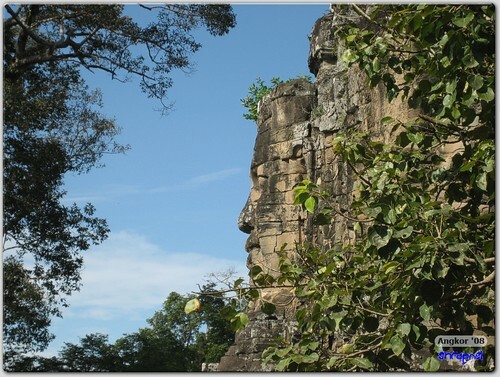 There are fifty-four Gods and Asuras on each side of the causeway, making it a total of 108 divine statutes guarding the entrance at each gate of Angkor Thom. The entrance through the South Gate is framed by a 23m tall Gopura, that has the carved resemblance of King Jayavarman VII on each of the cardinal directions. 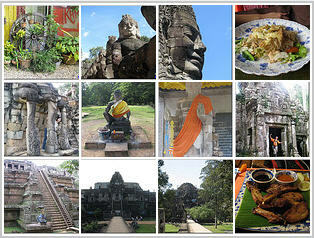 This is a sampling of the architecture of Bayon, which we shall more of it at the State Temple. The majestic South Gate standing at 23 m (or 75 ft) tall. Because the entrance of the Gopura was built to accommodate elephants passing through, we can actually drive through them with a truck or van but only one vehicle may pass at a time (see above). 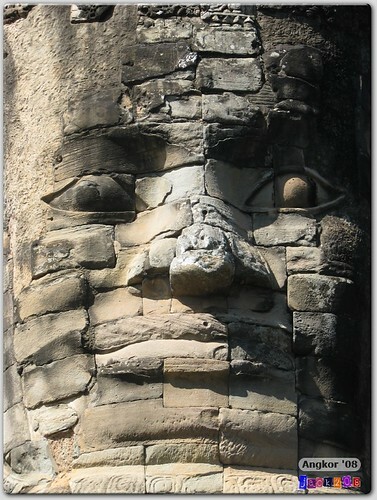 The picture above is a close-up of the carved resemblance of Jayavarman at the South Gate. We find that the carvings here are not as distinctive as those we shall see later at the Bayon, the state temple during Jayavarman VII’s reign. 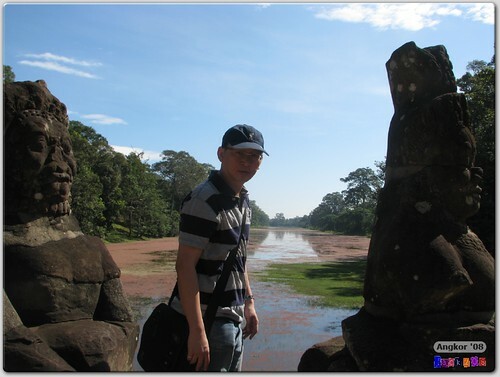 That’s me overlooking the 100m wide moat that surrounds Angkor Thom. 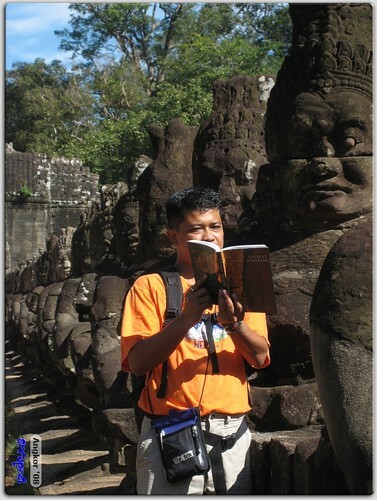 Stay tune for the next installment of the Angkor ’08 trip – Day One of Temple Visits where we reached the State Temple of Jayavarman VII – The Bayon. 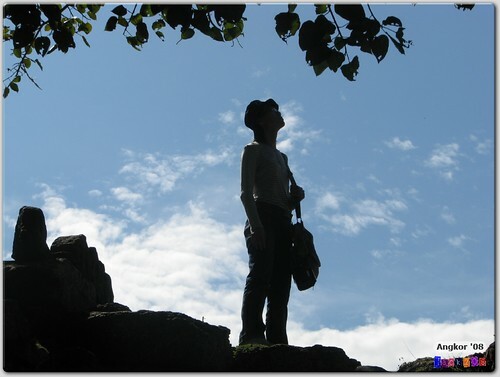 I like this one..Nice Pictures you have..